Americas gateway to the universe. Leading the world in preparing and launching missions to Earth and beyond.December 10, 1999 John F. Kennedy Space CenterVol. 38, No. 25 Spaceport News FOOTPRINT FOOTPRINT FOOTPRINT FOOTPRINT FOOTPRINT FOOTPRINT FOOTPRINT FOOTPRINT FOOTPRINT FOOTPRINT As the 1900s dawned, space flight existed only in the imaginations of a few authors of fiction. As the century wanes, space flight is a reality taken for granted by all. In a century dominated by rapid technological vaults, the most profound achievement has been the human conquest of space. And the epicenter of that previously unimaginable endeavor has been a swath of land straddling the Banana River on Floridas East coast Cape Canaveral and Kennedy Space Center. On July 24, 1950, a twostage rocket called Bumper soared above the scrub land of Cape Canaveral, christening what would become the worlds space flight capital. KSC employees are well acquainted with the historic successes that followed, from the Mercury and Gemini programs through Apollo and the Space Shuttle and, finally, the beginning of construction of the International Space Station. As KSC peers into the year 2000 and beyond, more sophisticated forms of space travel exist not in the exotic realm of science fiction but in the plans of NASA managers. Those plans already are taking shape in many projects at KSC. With this issue, we offer a pictorial history of space flight on pages 2 through 5.on a centuryLaunch nears for STS-103 It is a mantra often heard from the management of NASA and Kennedy Space Center: Safety comes first. The agency and KSC proved their dedication to that motto with the massive and meticulous inspections and repairs of the four Space Shuttle vehicles following an electrical problem during the launch of STS-93 in July. The undertaking has been tedious for KSC workers, but Shuttle processing teams have carried out their role. The most detailed examination of the Space Shuttle fleet in more than a decade will culminate with the launch of the orbiter Discovery on mission STS-103, the final Shuttle mission of the year. The crew of Discovery will embark on the third servicing of the Hubble Space Telescope. Four spacewalks are planned during the flight. The mission will be led by Commander Curtis L. Brown Jr. Scott J. Kelly will serve as Pilot and Steven L. Smith as Payload Commander. The Mission Specialists are C. Michael Foale, John M. Grunsfeld and Claude Nicollier and JeanFrancois Clervoy of the European Space Agency. 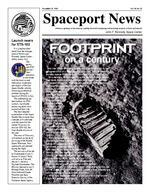 SPACEPORT NEWS December 10, 1999 Page 2 Clockwise from right: The original seven Project Mercury astronauts. ... The Gemini 7 capsule, carrying astronauts Frank Borman and James Lovell, is seen from the Gemini 6A capsule during a rendevous in space. ... Astronaut Gordon Cooper walks from his living quarters at Hangar S early on May 15, 1963, trailed by Dr. H.A. Minners, Crew Flight Surgeon. Cooper was driven to Launch Complex 14 and launched on Faith 7, NASAs fourth manned orbital mission. ... An interior view of the Mission Control Center at KSC during the launch sequence of Sigma 7 on Oct. 3, 1962. ... A Mercury-Atlas 7 lifts off from Complex 14 on May 24, 1962. The rocket, named Aurora 7, carried astronaut Scott Carpenter on NASAs second manned orbital mission. Timeline ...(Continued from Page 4 )Page 5 SPACEPORT NEWS December 10, 1999 corrosive alkaline electrolyte and inexpensive nickel electrodes. After 27 years, he perfected his fuel cell, demonstrating a fivekilowatt fuel cell that could power a welding machine. Bacon named his famous fuel cell design the Bacon Cell. In October 1959, Harry Karl Ihrig, engineer for the Allis-Chalmers Manufacturing Company, demonstrated a fuelcell-powered, 20 horsepower tractor, the first vehicle ever powered by a fuel cell. In the early 1960s, General Electric produced the fuel cell-based, electrical power system for NASAs Gemini and Apollo space capsules. Today the space shuttles electricity is provided by fuel cells, and the same fuel cells provide drinking water for the crew. 1903 Orville and Wilbur Wright proved mechanical flight was possible with their construction and flight of the Kitty Hawk Dec. 17, 1903 on the Outer Banks of North Carolina. They made historys first powered, sustained and controlled airplane flights from level ground without any assistance at takeoff. 1914 Robert H. Goddard began rocketry experiments in the United States, earning two(See Timeline, Page 6) Descending from left to right:. ... The nose of the Space Shuttle glides above the Earth as seen from the Russian station Mir during STS81. ... A trio of astronauts makes repairs to the Intelsat satellite in the payload bay during mission STS49. ... Mission specialist Tamara Jernigan attaches the Strela crane to the International Space Station during a space walk on STS-96. ... The Space Shuttle Discovery rises above Pad 39B at the launch of STS-95 on October 29, 1998. ... The first two elements of the International Space Station, Unity and Zarya, in an image captured during STS-88. John F. Kennedy Space Center Managing editor. . . . . . . . . . . . . . . . . Bruce Buckingham Editor. . . . . . . . . . . . . . . . . . . . . . . Gary White Editorial support provided by InDyne Inc. Writers Group. NASA at KSC is located on the Internet at http://www.ksc.nasa.govUSGPO: 533-128/00021Spaceport News Spaceport News is an official publication of the Kennedy Space Center and is published on alternate Fridays by the Public Affairs Office in the interest of KSC civil service and contractor employees. Contributions are welcome and should be submitted two weeks before publication to the Media Services Branch, AB-F1. E-mail submissions can be sent to Gary.White-4@ksc.nasa.gov SPACEPORT NEWSDecember 10, 1999 Page 6 patents for the first liquid-fueled rocket and the first modern multi-stage rocket. They were the first of 214 patents in all. Soon after, he developed the fundamental mathematics of rocket propulsion, and in 1920 he proposed that it might be possible one day to send a rocket to the moon. World War II Advances in flight came rapidly during and after WWII. The essentials of the modern turbojet were contained in a 1930 patent in England by Frank Whittle. His design was first tested in 1937 and flew in 1941. Independently, Germany produced a patent in 1935 and flew a turbojetpowered aircraft in 1939. 1944 Modern rocket development during the 1930s and s opened the window to the space age. Wernher Von Braun directed Germanys rocket development program, where he and his team of scientists built the famous V2 rockets used against England during World War II. Von Braun later went to work for the United States. 1946 The first fully electronic computer, the ENIAC I, was developed by John Mauchly and John Presper Eckert for the U.S. military, which needed a calculating device for writing artillery firing tables. It took the team about one year to design the ENIAC and 18 months and $500,000 tax dollars to build it. However, it was never used for its intended purpose because by the time it was built, the war was over. 1957 The U.S.S.R. launched Sputnik, the first artificial satellite. Sputnik was equipped with transmitters to broadcast on frequencies at 20 and 40 MHz so everyone would know it was upTimeline ...(Continued from Page 5)The frame of the Reusable Launch Vehicle hangar rises near the Shuttle Landing Facility in this photo taken in October. The hangar signifies the future of space flight at Kennedy Space Center. Cooperation between Kennedy Space Center and the Florida Department of Transportation (FDOT) has led to a Reimbursable Space Act Agreement to allow the FDOT to utilize the KSC Compressed Natural Gas (CNG) Fueling Facility. This has enabled the FDOT to deploy CNG-powered pickup trucks in Brevard County. The initial fill-up of vehicles on Nov. 9 represents another milestone in our transition to clean-burning, domestically produced fuels. CNGpowered vehicles emit approximately 80 percent less harmful exhaust than gasoline. This mutually beneficial agreement was made possible by the cooperation of the NASA Central Budget office, Chief Counsels office, Logistics Operations, JBOSC Energy Office, GSA Fleet Management and FDOT. KSCs allowing the FDOT to refuel at its CNG fueling facility will enable the state agency to deploy approximately 10 CNG powered vehicles over the next two years to the North Brevard County area.KSC opens fuel pumps to stateHoliday generosityFrom left, Boeing Company employees Laurie McManus, Janine Gresham and Beth Blakeney display some of the donations received in the Toys for Tots campaign. The campaign runs through Dec. 16. Donations of new, unwrapped toys to any Boeing office at KSC or Cape Canaveral Air Station will go to children in Brevard.there. The launch shocked Americans and spurred the efforts to launch an American satellite. 1958 The U.S. launched its first satellite, Explorer I, from Cape Canaveral. In 1956, the Army Ballistic Missile Agency was established at Redstone Arsenal under Wernher von Brauns leadership to develop the Jupiter intermediate range ballistic missile. A version of the Redstone rocket, known as the Jupiter C, was used to launch Explorer I on Jan. 31, 1958.